For years now, when time and money allows, The Bloke and I have been going on various little holidays up and down the eastern coast of this Great Southern Land. Generally speaking we head north from the Big Smoke, seeking surf and serenity at one of any number of beaches that we count as favourites (the list is extensive and ever-expanding). Why we choose to vacation beside the sea when our family home is located less than a kilometre from the nearest beach may be a mystery to many, but it’s a pattern that has remained unchanged since the arrival of Marvel Girl and Miss Malaprop. And what it usually means is that every school holidays, the family piles into the car and we drive along the Pacific Highway as far north as we intend to go, then turn right and head for whichever stretch of coastline is currently taking our fancy. You see, some time ago, some bright spark (who may or may not be the author of this blog) was having yet another whinge about her husband’s surfboard collection – or quiver, to use the correct terminology in surfing wankery parlance – which, like a certain list of favourite beaches, is extensive and ever-expanding. She was, she said, sick to death of sand being tracked through every holiday rental and of surfboards being strapped to the station wagon roof. And so, in deepest midwinter, she booked a different kind of holiday for the family’s post-Christmas summer jaunt: an inland holiday, beside a meandering river and surrounded by rolling hills. 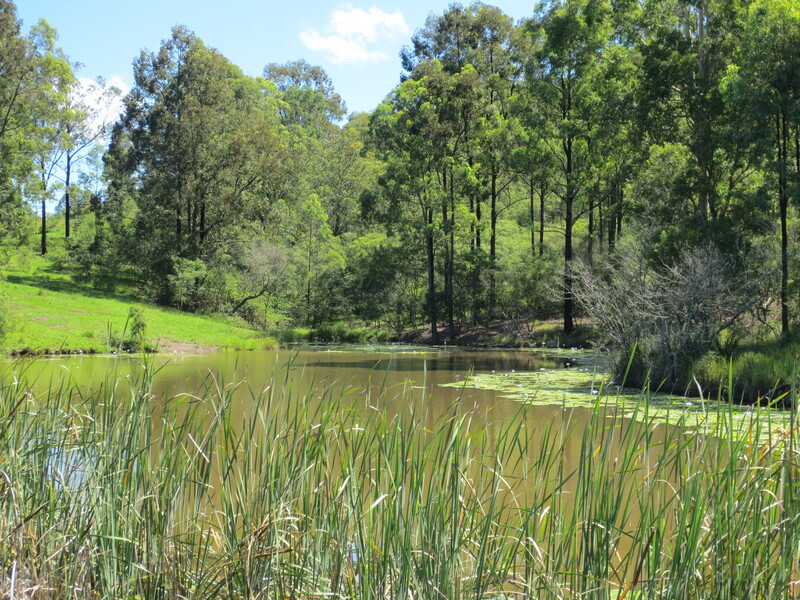 Not quite a farm stay, but one that involved charming pursuits like horse riding, bush walking, canoeing and perhaps even a spot of platypus watching. Now, you must understand, booking any sort of vacation invariably — and immediately — involves The Bloke asking the two all-important questions about the destination I have chosen, namely: is there any surf, closely followed by just how good is that surf. (Yes, yes, it was me having the whinge about the ridiculous number of surfboards he owns.) I freely admit that I frequently engage in a spot of melodramatic eye rolling while answering these questions about the proposed location as briefly and perfunctorily as I can. My responses never extend to pointless minutiae relating to the number of breaks at the chosen beach or whether they are left or right handed or whatever, but generally involve some glib quip about the fact that they’re not going to stop making waves any time soon, so he can take what he gets. I will also admit that I do recall feeling inordinately pleased with myself that I had somehow persuaded The Bloke that an inland holiday would be a wonderful experience for the whole family – enriching, even – a welcome change from whatever stretch of coast we would have headed to otherwise. It felt truly exhilarating, and more than a little sacrilegious. Until the months rolled by and Christmas came and went, and suddenly we were pulling out of the driveway and heading north in the station wagon once more, sans surfboards on the roof. And then we turned left. No one could have been more surprised as I was when we finally arrived at our new, inland, holiday destination. After some dithering from the front desk staff we were directed to our cabin, our home for the next six nights. I must admit that my breath did catch slightly when we pulled up to that dingy brown shack, which bore little or no resemblance to the smart little cottages featured on the resort’s website and glossy brochure, and I might even have groaned aloud when we finally managed to yank open the ancient sliding door and peered in. The entire cabin was outfitted in what might best be described as Soviet-style grey: the kitchen cupboards, the threadbare bed linen on the kids’ bunks (which were not made up beyond a base sheet), the sagging vinyl couch in the living room — all grey. That said, I did note that the colour scheme matched the relentlessly pouring rain outside, and soon found an exception to the rule in the towels that had been provided, which were an unusual shade of…tan…or perhaps something slightly murkier. And yet, while I stalked around trying to cram food for a family of four into the tiny, rusting bar fridge (the website had depicted a clean, well-lit cabin with a gleaming full sized fridge), the kids were already enthusing about the prospect of sleeping in bunk beds and The Bloke was happily eyeing off the (steadily rising) river and was unpacking the girls’ wetsuits. To their credit, they largely ignored the dark mutterings of She Who Books The Holiday Accommodation about the Trade Practices Act and false and misleading advertising and, bless them, had already got on with the business of making the best of things. It took me the better part of two days, a decent massage and the sun coming out for me to get out of my funk. And when I was finally able to shrug it off, I was able appreciate the holiday my lovely family were already enjoying. We bushwalked, led the kids around paddocks on horses (a dream come true for Marvel Girl), rode inner tubes down the river, went canoeing and platypus spotting (though saw none), made a couple of trips to the swimming pool in the nearest country town, visited a local farm to meet the animals up close (this had to be done twice it the girls loved it so much), and finally got down and boogied (like it was 1999 in Miss Malaprop’s case) at the bush dance in the resort’s wool shed on New Year’s Eve. And despite our less than appealing lodgings, the surrounding countryside was beautiful and the overall experience was an enriching one — not least because it made me take a long, hard look at myself. I know I won’t be in any rush to return to that particular resort, but I am glad I dug my heels in and pushed for a different kind of holiday: one that let Marvel Girl and Miss Malaprop discover a whole new world. I’ve already booked our next two holidays. Not surprisingly, they’re both by the beach. But down the track, when the urge takes us, I suspect we might just turn left again.